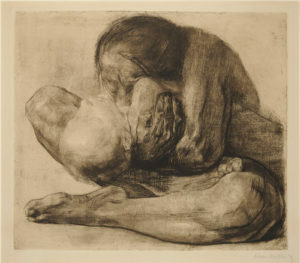 The stark, animal-like figure of a woman passionately embraces the corpse of a young boy. In 1914 this became reality for the artist when her younger son, the model for the dead boy, died in the early months of the First World War. The maternal grief for the dead boy signifies the artist’s hatred of wars and her pessimistic view of Germany at that time.